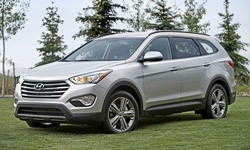 2013 Hyundai Santa Fe Pros and Cons: Why (Not) This Car? Thanks to a combination of price, warranty, styling, performance, and fuel efficiency, Hyundai has been on a roll. Still, it has suffered some flops. The Veracruz, a three-row crossover introduced for the 2007 model year, never sold well, and in recent years barely sold at all. In 2011 and 2012 Hyundai shifted over eight times as many of the half-size-smaller Santa Fe. For 2013, the Veracruz is gone, replaced by an extended length version of the Santa Fe. For cost and advertising reasons, offering the new Santa Fe in two lengths (with the shorter two-row variant labeled the Santa Fe Sport) makes a lot of sense. But is there any reason to think Hyundai will sell more three-row crossovers now? In an increasingly competitive field, what's special about this one? Interior attractive, if not the most welcoming thanks to some sci fi-flavored angularity. Why the 2013 Hyundai Santa Fe? Nothing impressed me more about the new Santa Fe than the amount of combined legroom. With a length of 193 inches (2.5 more than the Veracruz), the new crossover is four inches shorter than a Nissan Pathfinder and over seven inches shorter than a GMC Acadia, yet you'll find more legroom in its second and third rows. On top of this, unlike in the Nissan and GMC (but like in the Veracruz, this hasn't changed) the second-row seat is comfortably high off the floor. Alas, all is not good in this area--check out the cons below--so I haven't rated it against the Pathfinder. Unless you've been living under a rock, you're likely aware that Hyundais (and Kias) have longer standard warranties than their competitors. The basic warranty that covers most things last for five years / 60,000 miles, vs. 3/36 elsewhere. And for the first owner the powertrain warranty lasts for 10/100, vs. 5/60 to 5/100 elsewhere. But the Veracruz had this warranty, and didn't sell anyway. All fluid and perhaps even too pretty from this angle. Everything is easy to read and reach. Compared to a comparably equipped Nissan Pathfinder (also redesigned for 2013), a Hyundai Santa Fe Limited with Technology Package lists for $5,300 less before adjusting for remaining feature differences, and about $4,000 less afterwards. The Hyundai is similarly thousands less than a Honda Pilot or Toyota Highlander. But so was the Veracruz, which listed for only $175 more than the new Santa Fe (no big price cut). It's possible that the $38,595 sticker on a loaded all-wheel-drive Santa Fe (and even the nearly $30,000 sticker on a front-wheel-drive GLS) seems a bit steep for a Hyundai even if it is significantly lower than competitors. The materials inside the 2013 Hyundai Santa Fe are at least as good as you'll find at this price point, and better than most. But the Veracruz's were also better than those of less expensive Hyundais, and easily competitive. The Hyundai Santa Fe isn't as wide as most competitors, and it consequently feels more maneuverable. Steering heft can be adjusted among three levels: comfort, normal, and sport. Unlike other writers at the press event, I preferred comfort, as the electric-assist steering felt more fluid and natural to me in its most boosted setting, yet still considerably less numb than the tiller in the Veracruz. In normal and especially in sport the steering sometimes felt artificially stiff. This pro only applies to the all-wheel-drive Santa Fe, which effectively employs brake-based torque vectoring to limit understeer and oversteer, for more balanced dynamics. The front-wheel-drive model handles about as well in the sort of casual driving most owners will engage in 99 percent of the time. But if you want to hustle along curvy roads in your family hauler (perhaps on the way to the slopes), you'll want to spend another $1,750 to get AWD. Even with AWD, the Santa Fe isn't remotely a sports car. Make a quick lane change on the highway, and the rear end sways a bit. But most three-row crossovers feel larger and heavier (because they are) and handle more sloppily. Though some feel a bit more tied down, none handles significantly better. Why Not the 2013 Hyundai Santa Fe? First the good stuff: the 2013 Hyundai Santa Fe is rated to tow 5,000 pounds, putting it in a many-way tie for second within the segment (behind GM's large crossovers, rated for 5,200 pounds). Also, both rows of seats can be easily folded from the tailgate, with no need to walk around to the rear doors. Now the bad: while the new Santa Fe can carry twice as much cargo behind the third row as the Veracruz, twice very little still isn't very much. Given the beyond adequate amount of legroom, if the third row seat could slide fore-and-aft like the second-row seats do this shortcoming could be alleviated. But it can't. Of course, families with one or two children can simply fold the third-row seat. With three children, my family would require a roof top carrier to safely travel in the Limited, as it has standard second-row captain's chairs (with no option to substitute the bench standard in the GLS). You'll find at least a little more cargo space behind the third row of most competitors, and much more in some of them. They also all offer a second-row bench in their top trim levels. Fold both rows, and cargo volume increases from 13 cubic feet to 80. This is virtually the same as in the Pathfinder and Ford Explorer, but short of most other competitors. As noted among the pros, you'll find abundant legroom in the Santa Fe. But shoulder room is a different story. The new Santa Fe's 74.2-inch width exceeds that of the typical compact crossover or midsize sedan, but is narrower than that of the Highlander, Veracruz, Pathfinder, Pilot, and Acadia by 1.0, 2.4, 3.0, 4.3, and 4.7 inches, respectively. For anyone seeking to sit three across in the second row (or who simply prefers the spacious ambiance of a wide vehicle in any row), the Santa Fe's consequently narrower interior could be the #1 downside of sharing as much as possible with the new two-row Santa Fe Sport. Then again, maximum shoulder room for three passengers is only an issue with the Santa Fe GLS. As mentioned in the preceding section, the Santa Fe Limited has standard captains chairs, and so can only seat six. Anyone seeking a full zoot crossover with seating for more people will have to shop elsewhere. For good or ill, captains chairs mandatory in the Limited. Comfortably high off the floor. You can get a fair amount of kit in the new Santa Fe, including proximity key, heated seats in the first two rows, and an unusually large panoramic sunroof. But if you want a power-adjustable steering column, cooled front seats, a factory-installed rear seat entertainment system, or the latest safety monitors (such as blind spot and lane departure warnings) you'll have to shop elsewhere. That's it for the significant cons. The Santa Fe's instrument panel is a bit high, so the view forward isn't as expansive as it is in some competing crossovers. But it's still pretty good. The view rearward is typical of the class, so the rearview camera optional (with leather) on the GLS and standard on the Limited is good to have. An around view camera system like that offered on the Nissan Pathfinder would be better. But in this class you can only get that feature on the Nissan. While the 2013 Santa Fe is fairly quiet inside, a few competitors (including the those from GM, Ford, and Nissan) are downright hushed. Also, while the new crossover rides smoothly on most roads, it can get a touch jiggly on some patchy or uneven pavement--a characteristic shared with some other Hyundais. Neither of these minor flaws should be deal-killers unless you must have the smoothest, quietest ride. If I was comparing the 2013 Hyundai Santa Fe to any competitor other than the Nissan Pathfinder, fuel economy would have been among the pros. Compared to the Veracruz, Hyundai downsized the V6 engine (from a 260-horsepower 3.8-liter to a 290-horsepower 3.3-liter) and removed a substantial 320 pounds of curb weight (an achievement of which they are justifiably proud). Both changes should improve fuel economy--and have. With AWD, the EPA ratings are now 18 mpg city, 24 mpg highway compared to 16 and 21, respectively, for the Veracruz. Good scores for a three-row crossover, but the new Pathfinder does a single mpg better despite being larger and heavier. Notably, Hyundai offers a pair of four-cylinder engines in the two-row Santa Fe Sport, a naturally-aspirated 190-horsepower 2.4-liter and a turbocharged 264-horsepower 2.0-liter. The latter has been pitched as a more fuel-efficient substitute for a V6. Why not offer it in the three-row Santa Fe? Likely because the smoother V6 seemed more in character and because the mpg benefit would have been minimal. Even in the lighter Sport the EPA rating is the same on the highway and only one mpg better in the city (19/24). Offering the naturally-aspirated four-cylinder engine (20/26 with AWD in the Sport) might have enabled the Santa Fe to match the Pathfinder's numbers, but at such a great cost in performance that few would have sold. Thanks to direct injection, the new engine is more powerful than the old one despite being smaller. It does have to rev a little higher than a larger engine, but it's smooth and quiet enough that this isn't a bother. The six-speed automatic downshifts smoothly and promptly when more power is needed. It's possible to get from rest to sixty in about eight seconds, about the same as the Pathfinder. Butterface? The Veracruz was a fairly attractive vehicle, but the smaller Santa Fe had a bolder front clip. With the 2013 redesign, Hyundai has stepped this boldness up a few more notches with a massive hexagonal chrome grille and large, high-mounted headlights. The resulting big angry face is my least favorite aspect of the new exterior. Perhaps I'm in the minority? To my eye, both ends appear disproportionately massive on the new two-row Santa Fe Sport. With 3.8 inches more wheelbase, 8.5 inches more length, and longer rear side windows, the Santa Fe's proportions appear much more balanced. It's not as edgy as the Sport, but it is prettier. Could it be too pretty? While the new Santa Fe does appear brawnier than the Veracruz did, aside from the grille and headlights it still looks more sleekly car-like than truck-imitating competitors. The 2013 Hyundai Santa Fe has some clear strengths, including excellent legroom given the vehicle's relatively short length, a long warranty, and a relatively low price. Anyone seeking to carry more than four people with their luggage still will be better off in a larger competitor. On the other hand, if you only sometimes need a third row, and won't need it while traveling, then the Santa Fe's handier in-between size could be ideal. But most of these strengths were also present in the Veracruz, to no avail. The major gains with the redesign involve fuel economy and handling. Is this enough? Perhaps. The biggest assist might come from the nameplate change. Many potential buyers probably never even knew the Veracruz existed. Though not a great vehicle, it deserved to sell better than it did. In contrast, the Hyundai Santa Fe has been selling well for years. Far more people are aware of it. With ads now able to cover two models, Hyundai can afford to build awareness even more. Smaller than last year, but more efficient, more powerful, and sufficiently quick. Your groceries should all fit. Your family's luggage won't. Hyundai provided insured, fueled vehicles and lunch at a press drive event. 2013 Hyundai Santa Fe pros and cons, according to Michael Karesh: the best reasons for buying (or not buying) the 2013 Hyundai Santa Fe. Join TrueDelta to post your own impressions.